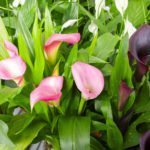 Why does my indoor Calla Lily droop? Am I over watering it or under watering? The plant droops if the dirt looks dry. The leaves feel wet. It's very strange. It's an indoor plant. Your plant does look a bit leggy. It may need more sunlight. Find the brightest location you have. Also check the soil. It should be moist not soggy. The first inch or so should dry out before watering again. Here are a few links for you to refresh you on the care needed.